You’ve invested many years in your profession and built a life making wise decisions. As you prepare for your financial future, selecting the right partner to manage your investments may be one of the most important decisions you’ll ever make. 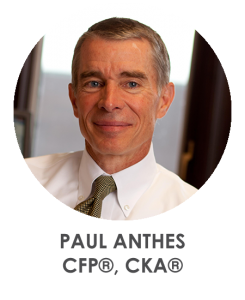 With a strong desire to build a team-based approach to offering objective financial wisdom, Paul Anthes founded Financial Advisory Corporation in 1988, to help you clarify and pursue your preferred financial future. Through FAC’s unique service model, Paul and his team have helped hundreds of West Michigan families with a wide variety of needs clarify their investment plan and retire with confidence. Paul and his wife, both lifelong residents of West Michigan, have been married over 38 years and have two children. Paul enjoys staying active throughout all four seasons and particularly enjoys golf throughout the summer months as well as platform tennis and skiing during the winter.